There are lots of our Planes out there scattered throughout the world! Snap a picture of yourself in front of one of our planes in the real world and send it in! You can post here, on Facebook, or on Twitter @WoWP to receive a special Prize Bundle! Get out there and start hunting! I really want to take part in this, but I live in a part of the world where preserved WW2 relics are a bit of a rarity. I wanted to know if closely-related planes are considered, such as a Harvard-- which doesn't appear in the game, but is very close to a Wirraway; or a T-33, the trainer variant of the P-80; or a CAC Sabre as opposed to the American F-86. Also, how long will this offer stand? I live in Malaysia, but I'll be visiting Thailand next month and I may hop by their Air Force Museum to snap myself next to a Spitfire XIVe in Royal Thai Air Force markings, just so that I can take part in this. Well, I have a lot of old pictures of me running around the U.S. and taking pictures of planes, and I do have one selfie. It's 2018, anything is possible, including being a living anime girl. 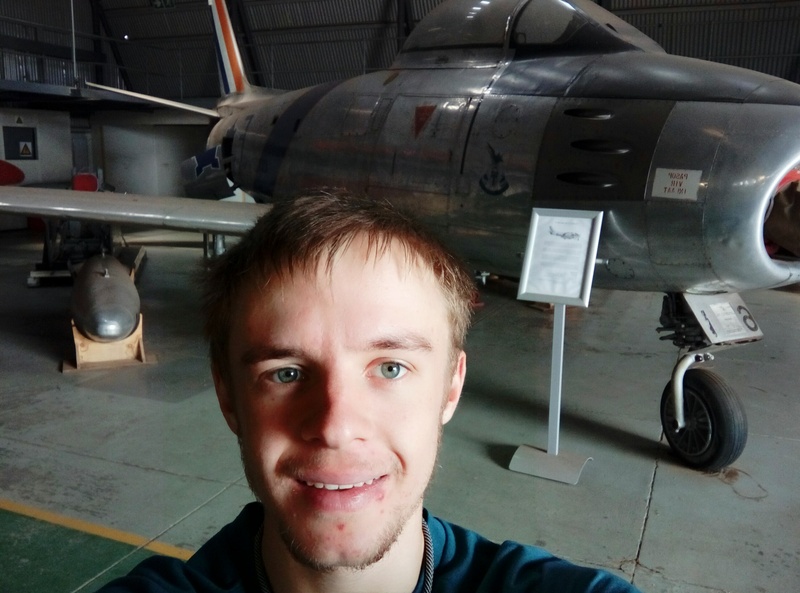 I do quite love my Corsairs, both in real life and in game, so I've taken as many opportunities as possible to snap photos with them, in this case I was taking a selfie with an F4U-4 Corsair on USS Midway in San Diego. "A glass of windex a day keeps the superunicums away"
Edited by f16falcona46, 01 June 2018 - 08:10 PM. Another anime girl eh? Sorry to say but that's a picture of a B-29, which isn't in the game yet. Still a nice selfie you took though. How recent do these pictures have to be?... 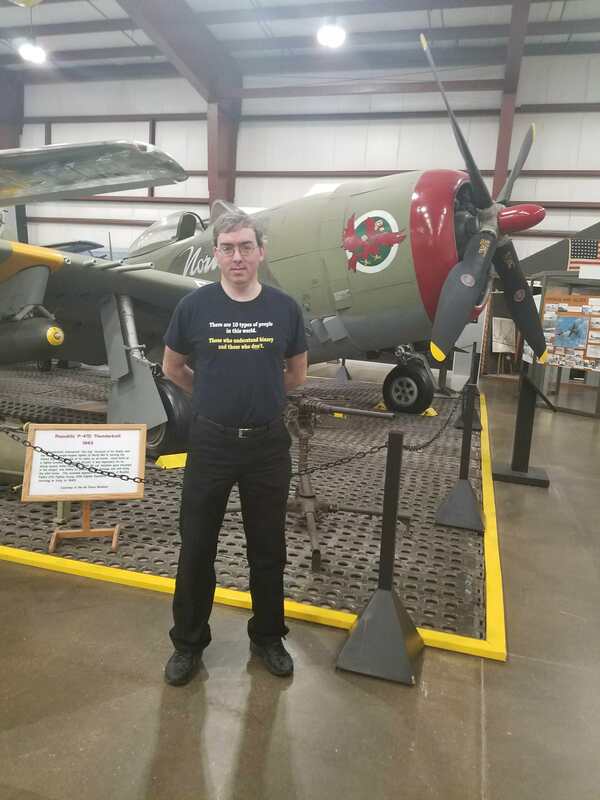 I don't know of any aviation museums in my state, but I do have a picture standing in front of a Hawker Hurricane when I was 10. [MAHOU] flank caller in tonks, [-K-] BB main (and supertest coordinator) in botes, here to shoot some planes and have fun. If memory serves me right that museum has a couple rare birds that are in game, like a Hawk III and a Hawk-75M in RTAF markings as well. Hawkeye's Hangar, your one stop spot for all my repaints. Like me on Facebook for news, updates and more. By sheer good luck, I was off to visit the New England Air Museum today. 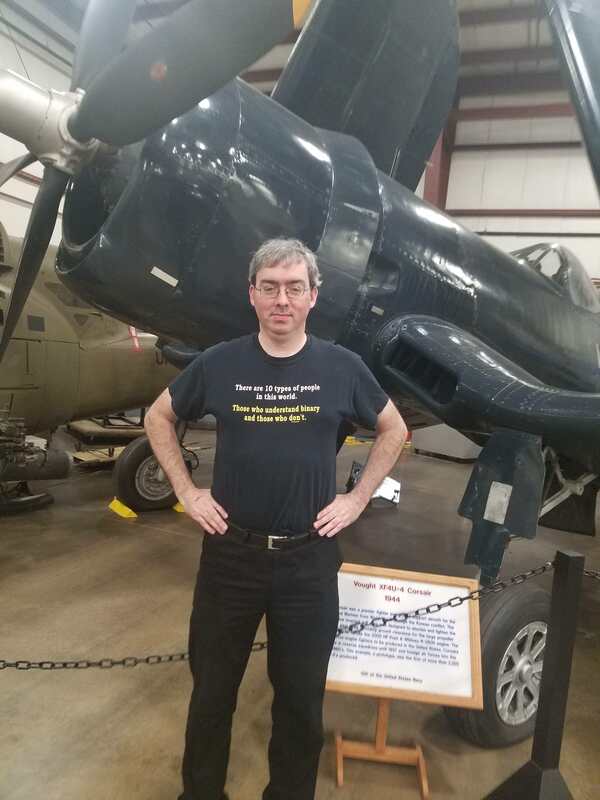 So here's me and their F4U-4 Corsair. ...OK, so *technically* it is an XF4U-4 Corsair. To be on the safe side, here's a P-47 Thunderbolt. Same museum. Sorry for the links, but the images are HUGE and I don't have time now to re-size. Will fix later...if I remember. They have a few other aircraft that are in the game on display too. I'll post those elsewhere in the forums when I have more time. I have a birthday to celebrate. Edited by D_Jackson531, 02 June 2018 - 10:29 PM. Mom is an engineer. I wear the shirt she gave me on my birthday to make her happy. Luckily, enough of her genes rubbed off that, while not a full engineer, I can get the joke. Edited by D_Jackson531, 03 June 2018 - 02:25 AM. When is this contest over? There is a WW2 wing at the Museum of Flight that has lots of planes. There were 3 engineers on a road trip, when suddenly the engine quit. The electrical engineer says "I bet it's the battery. I'll go back to town and get us a new one and we'll be good to go." The chemical engineer says "Nah, we ran out of gas. I'll go back to town and get us a few gallons of gas and we'll be good to go." The software engineer says "Let's try getting out and then getting back in again!" looks like a great place to gawk at amazing planes!